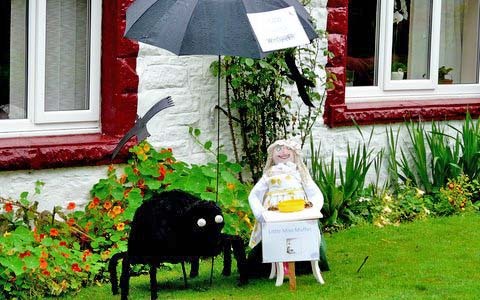 This wonderful scarecrow display of Little Miss Muffet was built by Hugh and Kate Beesley of Farlam Parish in UK. Hugh said that the huge spider made quite an impression on the local dogs. The spider was about the size of a large Labrador dog and when people walked past with their dogs it caused quite a furore as they barked and snarled at the giant spider! 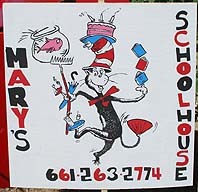 Mary's Schoolhouse AKA Gregory Family Child Care in Valencia, California, teachers, Mary Gregory and Beckie Peterson along with preschool students, Kelsie Lamens-Ross, Gianna Gregory, Reece Casey, Michael Mair, Christian Hernandez, Marissa Berns, Brsyen Pang, Annie Chen, Amani Massoud, Justin Luo, Chase Bowers and Jack Piolatto created the crows from black boa feathers and gluing individual real black feathers and made the signs. 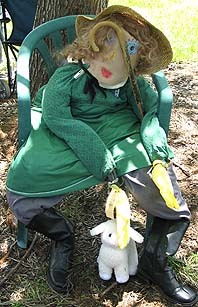 This scarecrow seems to represent the nursery rhyme Little Bo Peep with her lamb and her crook. 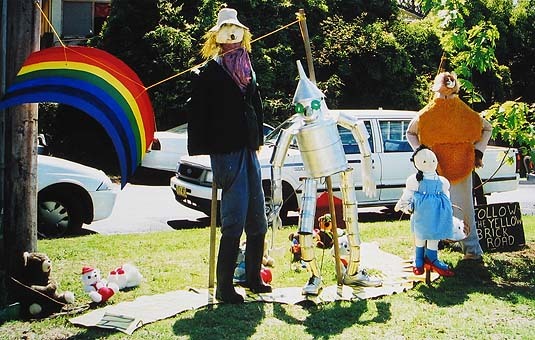 What a wealth of colourful characters there are in Fairy Tales for the scarecrow maker! 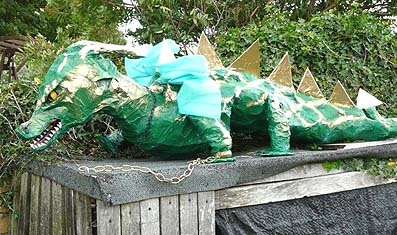 Here is a spectacular scarecrow display of a fierce green dragon built by Sue and Marshall Stockwell of Farlam Parish in UK. Photograph courtesy of Hugh Beesely. 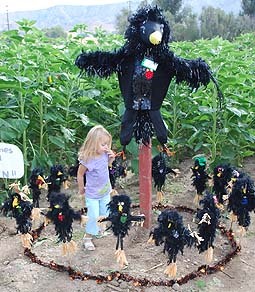 Finally, there are many great ideas for scarecrows in stories and novels. 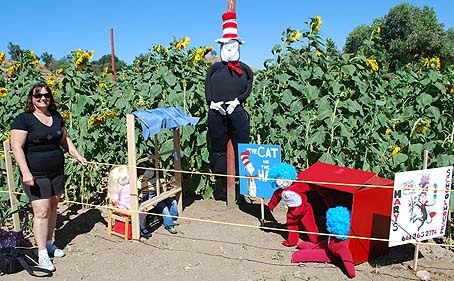 Teachers, Mary Gregory and Beckie Warloe, designed and set up this colourful Cat in the Hat display with help from prechoolers, Luca, Amani, Gianna, Reece, Bailey, Justin, Kelsie, Matthew, Brysen, Chase and Annie. Well done teachers and children! 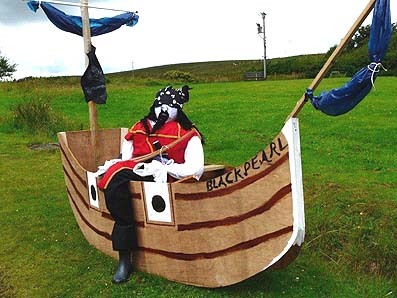 Here is a beautifully constructed scarecrow display built by Aiden Potts of Farlam Parish in UK featuring a splendid pirate complete with his pirate ship! Photograph courtesy of Hugh Beesely. 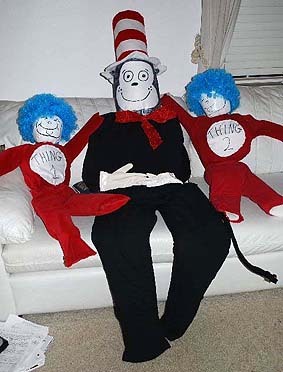 So turn out the knaves, all three. 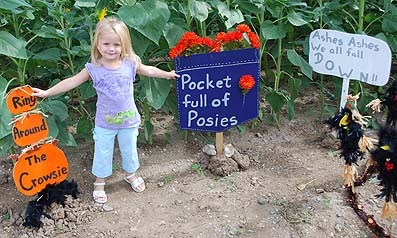 Note: This page includes scarecrow ideas for you and your kids to make in a nursery rhyme, fairy story, fairy tale or children's classic story theme. 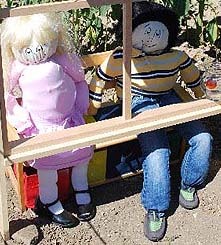 Set your scarecrow making skills to making a scarecrow Little Miss Muffet, a scare crow Mary Mary Quite Contrary, a scarecrow Old King Cole, a scarecrow Crooked Man, a scarecrow Cinderella, a scarecrow Hansel and Gretel, a scarcrow Rapunzel, a scarecrow Alice in Wonderland, a scarecrow Wizard of Oz and many more!